What a weird, wacky story is the Rebirth Batman: Detective Comics Vol. 5: A Lonely Place of Living. A Red Robin Tim Drake spotlight book that serves to re-establish much of Tim's pre-Flashpoint origins, I had thought based on solicitations that this would also involve Robin-mythos stalwarts Spoiler and Anarky (who actually appear in the second story included). Instead, this Rebirth tie-in (pit stop? ), with a secondary revelation of Mr. Oz's identity, is considerably more of a superhero sci-fi story than we normally see in a Batman book, and with tendrils that reach forward to Batwoman, Superman, and Super Sons, among other DC titles. As a sequel to the story Lonely Place of Dying, writer James Tynion's ties are largely more thematic than plot-based, which perhaps is the right way to go. Controversially, Tynion holds over one of this book's most pressing questions for the next volume, though in the non-answer perhaps we get our answer. Between the last book and this one we learned Tynion is leaving this title, and to that point this volume foreshadows its own end; there is triumph here in the apparent return of Tim Drake, though it's bittersweet in our sense that there isn't much time left to enjoy it. Marv Wolfman's classic "Lonely Place of Dying," except for the inclusion of Tim Drake, is a grounded, straightforward Batman story -- almost quaint in its "mystery" of Two-Face's dual-themed crimes. I mean no disrespect; what Dying lacks in twists it makes up for in pure emotion, and it is in some ways the last, best innocent "Batman's rogue runs a caper" story before comics weren't allowed to be so simple anymore. 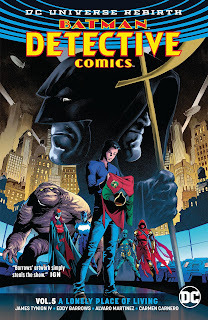 Lonely Place of Living is the opposite, a story rife with time travel and cosmic sci-fi, its own concerns almost secondary to Tynion's ongoing Detective story (and Marguerite Bennett's Batwoman) and also to the Rebirth narrative and the "Super Sons of Tomorrow" crossover in Superman, Super Sons, and Teen Titans. It's can't afford the kind of innocence of Dying's era. Living's dark pallet is as much a sign of its times as Dying's more sunlit one is. Living is better stated as a homage rather than a sequel to Dying (as Detective Comics Vol. 4: Deus Ex Machina was also a homage to "Knightfall" and etc.). The most distinct Dying material is in Living's beginning, essentially a line-by-line flashback to Dying that, most specifically, reestablishes Dying as something that happened, overwriting Tim's New 52 origin just as the New 52 origin overwrote Dying. After that, Living's exploration of Dying is primarily in theme, focusing on young Tim's own directive in Dying that Batman must have partners, and questioning what it meant for Tim himself to be the one to bring that idea to Batman and Nightwing. The Rebirth Detective, at its outset, stood on the precipice of Tim giving up the Red Robin identity forever, something that would be the full realization of Tim's demand from back in the Chuck Dixon days that he'd never grow up to be Batman. At the same time, from Dixon on down, the tension in the Tim character is that, as readers, we also the character would never really retire from the superhero life. So for almost thirty years the knot to unsnarl for the Tim character has been how to get him off the necessarily bogus claim that he'd give this all up one day. Tynion really made it look like Tim would retire and then took Tim off the board entirely, forestalling the resolution of the question. In an interesting move, Tynion demurs one more time at the end of Living, letting Tim defeat his own future self and then ending on an ambiguous splash page, Tim's back to the reader, with Batman on intercoms asking, "Tim, are you there? ... Is it over?" Is it indeed over? Again, the reader knows Tim will remain Red Robin (much like they knew President Bartlet would win reelection on The West Wing), and so what's at stake is more the "how" than the "whether"; because it's a weak hand, narratively, Tynion is right to drag it out. It leaves Living coy, however, on what it explores in Dying. Living's future Tim states almost outright that Tim's act of interceding with Batman all those years ago -- among other things, coming into Batman's life purposefully rather than by chance as with the other Robins -- means that Tim must become Batman someday. We don't ultimately get Tim's agreement or acceptance of that -- in deference to other writers and their Bat-characters, perhaps Tynion can't say that outright -- but possibly the lack of answer is itself an answer. One of Tynion's smartest explorations of Dying is in the title of this new story, addressing the decades-old incongruity that a story about Batman gaining a new Robin had "dying" in the title, making it sound more like a story of loss than renewal. Under Tynion's pen, "A Lonely Place of Living" seems a more apt title for the saga, since the point the present Tim makes is that loneliness is a choice, and in essence the choice Tim made for Batman all those years ago was not to be lonely and die, but rather to be lonely and live, joined then by Tim and now by the newly-dubbed "Gotham Knights" team that Tim created as a greater extension of the service he originally provided for Batman. Given Dying's relatively grounded plot, it is wildly bizarre how far out Living swings -- and again I was expecting a relatively grounded Spoiler and Anarky story, not a pre-Flashpoint Batman Tim Drake from the future coming to try to change the past (and talking about "Conner," no less). Even in a Detective Comics that's seen Zatanna and a magic bauble of limitless power, a foe from the future is far out for the Bat-titles -- something that Grant Morrison or Scott Snyder only nudged and winked at, never featured directly, and that would have been unheard of in the early post-Crisis Bat-titles. This kind of turn isn't bad, just relatively unprecedented, and at the same time I give Tynion credit for the story's lack of boundaries -- as if it were an everyday occurrance, Tynion uses in this story no less than Batman, Nightwing, Red Hood, Red Robin, Robin Damian Wayne, Alfred, Batwoman, Spoiler, Orphan Cassandra Cain, Azrael, Batwing, and Clayface, the kind of cast you'd only see in one title in the 1990s for a major crossover. There's a seasick feeling to the end of Batman: Detective Comics Vol. 5: A Lonely Place of Living in that future Tim talks about this being the beginning of the end for the Gotham Knights, just as we know James Tynion is leaving this title in the post-Dark Nights: Metal reshuffle. In the course of superhero comics, we surely expected this team to break up and get back together, but now we know they're breaking up and actually breaking up. Among the unfortunate parts of that -- not in the least whether another writer besides Tynion will treat Cassandra or Azrael as well as Tynion has -- is that it doesn't give us much time to see Tynion fully reestablish this rejuvenated Tim Drake, either. Optimally, as a service to the character, Tynion will answer the "Tim Drake question" before he's done; having brought the character this far, that's at least what's deserved.